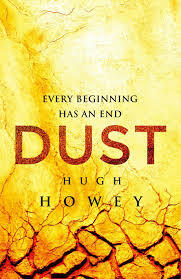 Dust, by Hugh Howey, is the third and last book in the Silo series. In Dust, the author leads you on a mesmerizing path that answers questions from Shift, the previous book, and even leaves more questions that wait to be answered. Dust is about how Silo 18 ventures through the secrets of Silo 1, the fallen silos, and the life of before. These “Silos” were built by the US government to protect important citizens in the case of an attack. However, nations such as Iraq and North Korea had technology that could destroy an entire nation with the use of nanos. So, the US took a sacrifice, and bombed everywhere but the area with the 50 silos, and planned for people to stay in the silos for hundreds of years. Throughout Shift, the reader learns how the silos were built, and how “Solo” survived by himself in Silo 17, and what Silo 1 has control over. Until the end of the book, the reader will be flipping through pages wondering how the characters survive the endless barrage of puzzles and mysteries that are thrown their way. There are many side characters in Dust, but the main characters will stay the same and most will live for the whole book. Juliet “Jules” Nichols is one of the main characters, and is the new mayor of Silo 18 as the books starts. Lukas, the Head of IT in Silo 18, is in a relationship with Jules. Jules is a problem-solver, and will not stop until she has all the answers to her questions. This is very relatable and common in main characters, but Jules surprised everyone when instead caring for the rest of the silo, she persisted on solving mysteries. She also does not really care for others opinions and suggestions, which is very surprising since protagonists are usually the opposite. For example, Jules wanted to dig her way to other silos, even though others were highly against it, for it broke every law they had ever known. The other main character is Donald, who resides in Silo 1. He was the one who made the designs for the silos in the life before, even though he did not know they would be used for such purposes. Throughout the book, Donald startles the reader with his rebellious acts against Silo 1 and his persistence and perseverance to see the outside. Another aspect of the book that was vital was Hugh’s writing style. He kept me holding my breath while he described situations that I thought the characters would never come out of. Suspense and mystery is not normally my favorite genres, but Hugh Howey does an amazing job that no others could come close to. The Silo series is definitely one of my favorite series of all time, and I would recommend it to anyone I know.